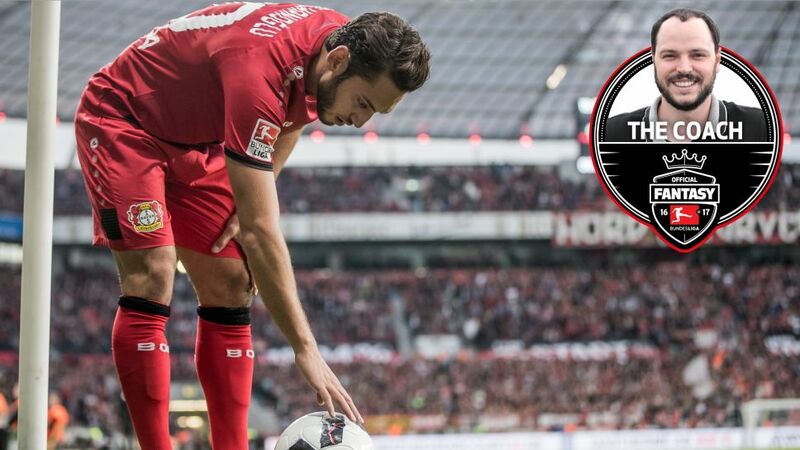 Leverkusen's Hakan Calhanoglu is primed to start in midfield against Darmstadt on Saturday. I’m not overly keen on international breaks as it means I don’t get my Bundesliga-fix for a week. And on the back of Matchday 10 we have yet another disruption to what is turning out to be a sensationally topsy-turvy season. The one positive is that Bundesliga head coaches may be less inclined to rotate their sides this weekend despite the energy-sapping fixture list, which could prove beneficial in Official Fantasy Bundesliga provided you successfully navigate the minefield. I’m here to lend a helping hand, so let’s hope I can build on last weekend’s 136-point tally that saw me close the gap on Flo ‘The Scout’ to just 26 points last time out. Leverkusen are coming off a big win in the UEFA Champions League courtesy of an outstanding performance of great intensity. If they manage to maintain that level on Saturday, it will be too much for Darmstadt as they return to their bread and butter of the Bundesliga where they are looking to close the gap on the top four. The Lillies are yet to pick up a point on the road, having only scored once in four games and I can’t see that changing at the BayArena. Hakan Calhanoglu (MF, 40pts, 14.1M): With Kevin Kampl likely to miss out with a foot injury, I need a replacement and Calhanoglu is top of my list after being rested in midweek. Jonathan Tah (DF, 52, 12.2M): Missed out last weekend only to return against Tottenham, Tah wins more than 10 challenges a game on average and is an aerial threat at the other end. Hamburg have proven to be a bogey team for Dortmund in recent years, but are in dire straits this season. Thomas Tuchel has several first-team regulars back at his disposal and is expected to bring Raphael Guerreiro, Gonzalo Castro and Andre Schürrle back into his starting line-up. BVB are without a league victory in four, so they couldn’t have picked a better time to face a Hamburg side sitting at the foot of the table and yet to win this season.